Business Writing for Success is an OER textbook for ENG 209: Business Writing at Leeward Community College and provides a comprehensive, integrated approach to the study and application of written and oral business communication to serve both student and professor. 1.2 Why Is It Important to Communicate Well? 4.3 How Is Writing Learned? Chapter 7: The Writing Process: How Do I Begin? Chapter 13: Writing Basics: What Makes a Good Sentence? Chapter 15: Working with Words: Which Word is Right? Chapter 18: Refining Your Writing: How Do I Improve My Writing Technique? 28.1 What Is a Group? Please share your supplementary material! 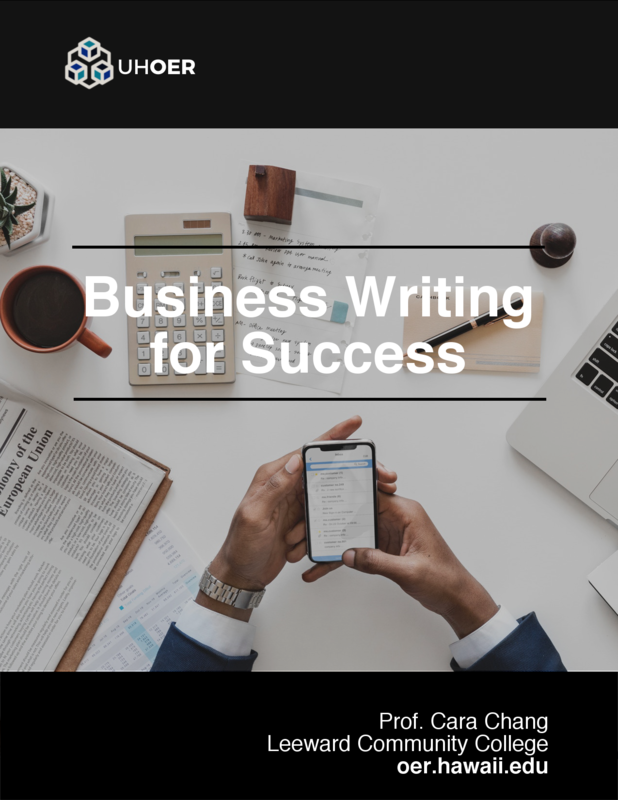 Business Writing for Success is adapted from two OER textbooks (Business Communication for Success and Business Writing). Business Communication for Success is a work produced by a publisher who has requested that they and the original author not receive attribution. This adapted edition is produced by the University of Minnesota Libraries Publishing through the eLearning Support Initiative. Postchapter assessments linked to objectives and skills acquisition. Each chapter is self-contained, allowing for mix-and-match flexibility and custom or course-specific design. Each chapter focuses on clear objectives and skill demonstrations that can be easily linked to your syllabus and state or federal requirements. Supported by internal and external assessments, each chapter features time-saving and learning-enhancement support for instructors and students. BCS is designed to help students identify important information, reinforce for retention, and demonstrate mastery with a clear outcome product. The first three chapters form the core foundation for the study of oral and written business communication. The next sequence of chapters focus on the process of writing, then oral performance with an emphasis on results. The final sequence focuses on contexts where business communication occurs, from interpersonal to intercultural, from groups to leadership. In each of the process and product chapter sequences, the chapters follow a natural flow, from prewriting to revision, from preparation for a presentation to performance. Each sequence comes together in a concluding chapter that focuses on action—where we apply the skills and techniques of written or oral communication in business, from writing a letter to presenting a sales speech. These performances not only serve to reinforce real-world applications but also may serve as course assessments. Business Writing for Success by University of Minnesota is licensed under a Creative Commons Attribution-NonCommercial-ShareAlike 4.0 International License, except where otherwise noted. University of Minnesota Libraries Publishing edition, 2015. This edition adapted from a work originally produced in 2010 by a publisher who has requested that it not receive attribution.